Fact: Orangutan habitats are being destroyed by the harvesting of something we use nearly every day without even thinking twice, palm oil. As more and more palm oil plantations are being built, the natural habitat of the orangutan is being destroyed to make room for the fields. The burning of the rain forest is the number one cause of air pollution in Southeast Asia. This alone is enough to harm a global environment with rippled effects. With such easy access to many things in the Erie region, it's easy to find various organizations and companies dedicated solely to the purpose of making Erie a more eco-friendly place. However, it can be challenging to get little kids involved in such heavy political topics. 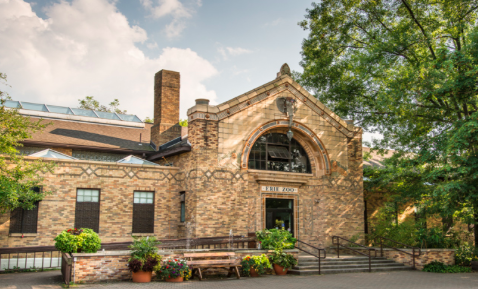 This is where the Erie Zoo has taken the initiative through its educational programming to step up and make environmental awareness programming that is specifically directed towards children. With group and individual tours of the zoo, behind the scenes tours, and multiple ways to bring the zoo to the classroom, it's easy to be informed and aware. It's lessons like that of the Orangutan that the zoo wants children to learn from. This not only allows the children to become more aware of these issues early on, but to take what they learn home, and relay it to their parents or other adults they interact with. In the end, this would produce a change in lifestyle around the home and make it a greener place. Aquaponics ponds allow for things such as herbs and occasionally vegetables to be grown in water. These are all great examples of ways kids can get involved and are fairly cheap and easy. Aside from what the zoo is doing within the confines of its facilities, it has also branched out into the Erie community and is working closely with Asbury Woods on the topic of frogs. Asbury Woods is a designated frog watch site for the zoo. A lot of valuable data about the frogs and their health can help scientists learn a great deal about the state of the environment in our area. The state of these frogs' immune systems is often a good indicator of how many chemicals are creeping from the homes in the area to the natural environment. More information on the zoo and its programming can be found at the Erie Zoo's website.